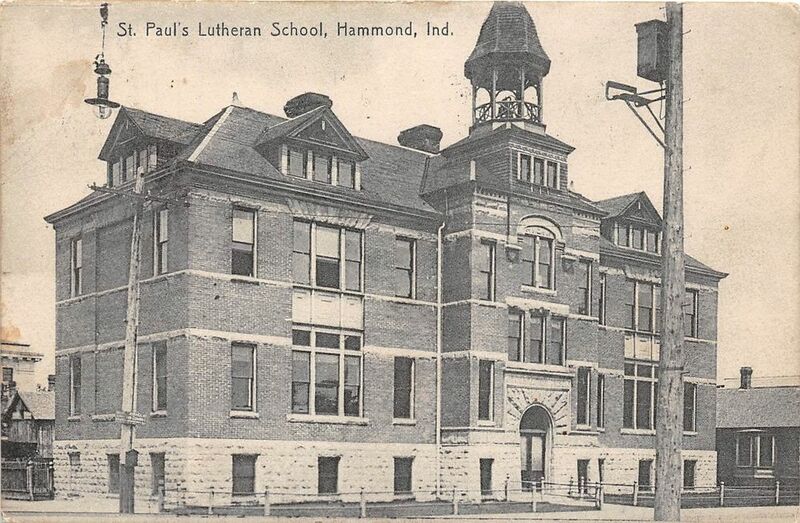 St. Paul's Evangelical Lutheran Church was formally organized in Hammond, Indiana, as a congregation in 1882 by German settlers to the Calumet region. For many years St. Paul's congregation worshiped at a facility located on Clinton Street in Hammond. A Christian Day School was begun in 1886, located for many years at Erie and Eaton Streets. The completion of our present Christian Life Center in 1980, saw, for the first time in our history, the church and day school under the same roof. St. Paul's has been a member congregation of the Lutheran Church, Missouri Synod since our organization. Through this fellowship with over 6,000 other Lutheran congregations, we support a variety of special ministries, support missionaries in 30 countries, participate in many social service agencies, and support a higher educational system of 13 colleges and two seminaries. You are warmly invited to visit any of our worship services and activities, to share in the love of Jesus that brings us together as God's people. 1882 – St. Paul’s Lutheran Church is organized at the home of Jacob Rimbach, Hammond, Indiana. 1883 – The first church building is dedicated on July 29th. This was the third church to be built in the recently incorporated town of Hammond. 1885 – Rev. G. F. Luebker becomes the first resident pastor of St. Paul’s. Pastor Luebker was instrumental in developing the day school. 1886 – The first school building is built at a cost of $380. 1889 – Mr. H. Mashoff became the first regular teacher at the school. Rev. Luebker was replaced by Rev. T. W. Herzberger who had been the Pastor at the Hegewisch (Illinois) Church. 1892 – St. Paul’s celebrated its 10th anniversary on October 10 with a voter’s assembly of 110 members. 1894 – St. Paul’s joins what will be known as the Lutheran Church-Missouri Synod. 1896 – A third school building, consisting of four classrooms and a basement, is constructed. 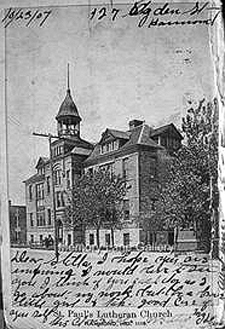 The school, located at Oakley and Sibley Streets, was dedicated on August 3, 1896. 1899 –After serving almost ten years at St. Paul’s, Rev. Herzberger accepts a call to St. Louis. Rev. W. H. T. Dau is called to be pastor of St. Paul’s. 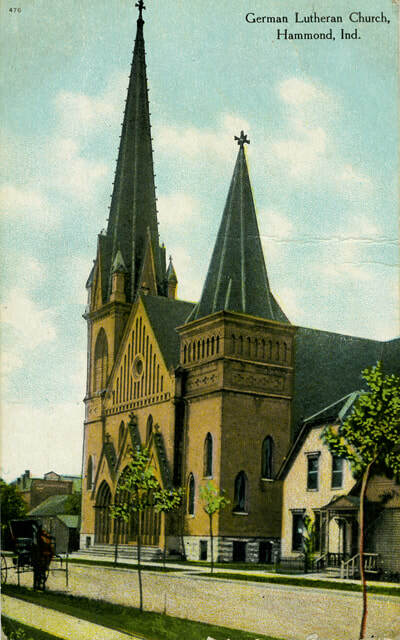 1903 – The third church building is dedicated. It was the first Protestant church of its size in the Calumet Region. The total cost of the new edifice was $30,000. 1905 – Rev. Dau is succeeded by Rev. Theodore Claus. 1907 – St. Paul’s celebrates its 25th anniversary with a total membership of 1,650. Three former pastors, Rev. Luebker, Rev. Herzberger, and Rev. Dau return to preach at the anniversary service. 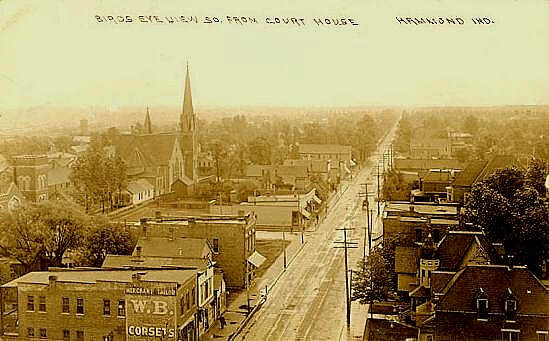 1916 – Members of St. Paul’s living in Hessville were released to affiliate with the newly organized Concordia Church there. 1918 – After 13 years, Rev. Claus resigns and is succeeded by Rev. Walter F. Lichtsinn, a native of Indiana who had been serving in Toronto, Canada. All instruction in the school is done in English instead of German. Both Church and School were closed for the month of October because of a nationwide flu epidemic. 1921 – Catechism instruction and confirmation are now done in English. 1926 – A branch Sunday School is opened in a store front building on the corner of 165th and Calumet with 40 children in attendance. 1937 – On January 17, services of praise were held to celebrate the dedication of the new organ. A special organ recital and choral performance enhanced the evening’s activities, which were attended by close to 1000. 1949 Rev. Walter E Ruehrdanz becomes the 8th pastor at St. Paul’s. 1954 – On May 9, Rev. Earl E. Weis becomes associate pastor. 1955 – Recognizing congregational growth southward, the Board of Missions sanctions the purchase of property on Columbia Avenue near Ridge Road in Munster. A children’s choir is organized by teacher David Brandt. 1959 – St. Paul’s Chapel in Munster is dedicated (presently the Salvation Army Center). 1963 – Dr. Lichtsinn retires. Rev. Weis assumes his responsibilities and Rev. Wilburn Michlak is installed as assistant pastor. 1968 – Rev. Weis accepts a call. Rev. William Niederbach is called as associate pastor. 1969 – Pastor Michalak assums the duties of Senior Pastor. A 14.5 acre site on Harrison Avenue and Briar Lane in Munster is purchased. 1970 – Plans are submitted for a Christian Life Center to be built at the Briar Lane site. 1972 – Rev. Michalk accepts a call to Lakeland, Florida. On November 26, Rev. Luther Russert of Lowell assumes pastoral duties. 1973 – Women become voting members of the Voters’ Assembly. 1977 – The Board of Deacons presents a resolution to unite St. Paul’s congregation by having one place of worship, in the Christian Life Center. On December 31, the final service is held at the downtown church. 1978 – Rev. Ronald Moritz is installed as pastor of St. Paul’s. Mr Waldemar Beckman celebrates his 40th anniversary as teacher/principal at St. Paul’s. 1980 – St. Paul’s dedicates its new church and school building in Munster. 1981 – St. Paul’s Lutheran School was moved to the Christian Life Center in Munster. 1982 – St. Paul’s celebrates its 100th anniversary, using the theme “Praising God for St. Paul’s First Century”. Saturday night services are added to the worship schedule. 1984 – The Rev. John W. Sattler was installed as the assistant pastor at St. Paul’s Evangelical Lutheran Church. 1991 – The voters approve the establishment of Day Care and Pre-School ministries. 1992 – August 23, the Reverend William Steinbauer is installed as the 15th called pastor of St. Paul’s. 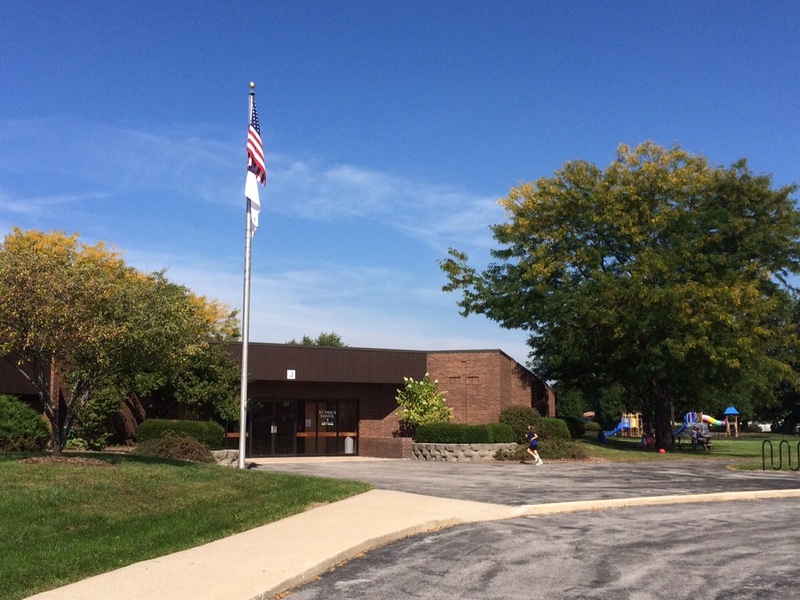 1995 – The voters approve a building expansion to accommodate the addition of an Early Childhood Center. 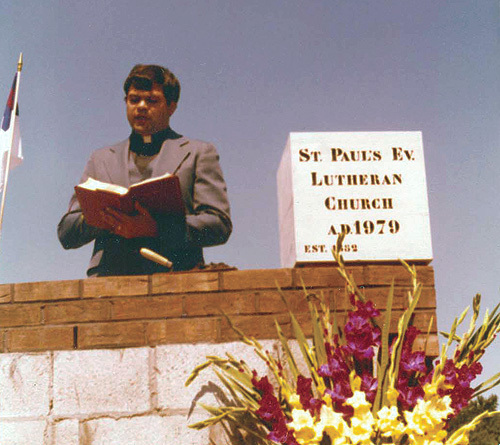 1996 – Pastor Paul Bretscher serves as vacancy pastor at St. Paul’s. 1997 – The Rev. Dr. Eric C. Stumpf is installed as the 16th pastor called by St. Paul’s. 1998 – The 17th called pastor by St. Paul’s, the Rev. Scott D. Bruick is installed. 2002 – Mr. Matthew Poronto was installed as Youth Minister and became the 18th called pastor at St. Paul’s. 2004 – The Rev. Donald Stock installed as the 19th called pastor at St. Paul’s. 2005 – St. Paul’s celebrates the 25th Anniversary of the Dedication of the Sanctuary. 2006 - "Blessed from Generation to Generation" is the theme for St. Paul's 125th Anniversary Celebration. 2013 - Pastor Eric Stumpf retired from full-time ministry. ​2014 - The Rev. Peter Speckhard installed as our 20th called pastor. 1907- St. Paul's School, Erie & Eaton, Hammond. 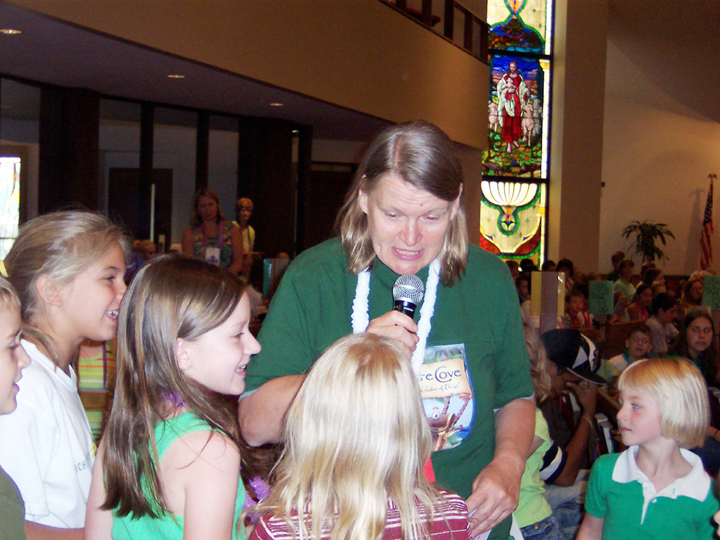 2010- Alice Ullman interviews kids at VBS.